‘Who you know’ makes all the difference! 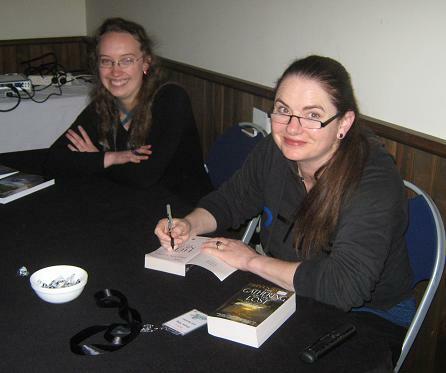 I went to UnCONventional with relatively few expectations (it being my first Con), but I did really want to meet Helen Lowe – a successfully published Fantasy / YA author from my home town (Christchurch, New Zealand). My partner and I arrived at the venue and I immediately spotted Helen sitting with other convention people, including Trudi Canavan (the Guest of Honor). They were deep in conversation and I had no intention of barging in to introduce myself. I figured I’d have the opportunity to say hello over the course of the weekend. Then Helen’s partner Andrew recognized my partner (they work at the same engineering company back in Christchurch), and suddenly we were being introduced and I was sitting next to Helen! Helen was so welcoming and gave me some great practical advice about how to approach my first-ever book reading the following morning. Even more awesomely, she came down to listen to me read the next day (despite the ungodly hour)! Helen and I sat at the same table for the group signing session. It was great to hear her talking to people and listen in on her tell another writer from the convention the story about her road to publishing. These ‘coincidences’ have been turning up more and more frequently in my life of late. I have learned never to discount a chance meeting or an opportunity to connect with another person, because you never know when or how that person will turn up again in your life.